With its pristine coastline, stunning mountains and world class hotels Oman is a true pleasure seeker’s paradise and we offer those with a passion for relaxation a superb range of indulgent accommodation options to choose from. Whether soaking up some sun by an infinity pool by day and enjoying the excellent Omani cuisine by night or travelling at a leisurely pace around the little-known parts of Oman we are confident we can tailor the perfect chill out experience to suit your individual taste and budget. Oman is also perfect for honeymoons, romantic breaks or any number of special occasions. The elegant mystery and breath-taking beauty of Oman, combined with its 5 star resorts, hotels and warm, friendly atmosphere makes for the perfect setting for a once in a lifetime experience that you will never forget. The contemporary design, fine dining and beachside pool of The Chedi is just one of the many luxurious hotel options around which you can start building your special and completely unique romantic experience. We have listed some of our favourite hotels (with a range of prices) for chilling out or romantic holidays. The ultimate in chic! Huge grounds for the number of rooms and never feels crowded. This 5 star hotel has beautiful water features which create little havens of tranquillity. Three infinity pools, with plenty of sunbeds make it a perfect place to indulge yourself. The food at all the Chedi’s restaurants is excellent, with The Restaurant, The Beach Restaurant and The Long Pool Cabana stand-out places for a relaxed or romantic meal. The largest spa in Muscat, a newly-built 800 square metre relaxation and fitness centre, offers the personalised, discreet service of the region’s finest wellness professionals. Balinese therapies, Indian Ayurveda and indigenous rituals are among the highlights on the spa’s thoughtful menu, delivered among thirteen meditative spa suites that combine dramatic Omani architecture with calming Asian interiors. Although part of the larger Shangri La complex, the palatial 6 star Al Husn is indeed, as its name implies, a suitably exclusive castle. Set against the dramatic backdrop of mountains and the waters of the Gulf of Oman, the Al Husn has a 100 metre private beach and its own exclusive infinity pool. Two culinary high points of Oman may be found at the Al Husn hotel; Sultanah, a stylish restaurant with a luxury cruise theme and Shahrazad, the only authentic Moroccan restaurant in Muscat, where you can savour traditional Moroccan favourites in a contemporary and refined setting. In addition to these the Capri Court offers a wonderful contemporary Italian experience. The CHI Spa, allows guests to enjoy the privacy and luxury of the largest spa villas in Muscat. From the calm serenity of the Spa’s welcoming inner sanctum, guests can enjoy the experience of the unique CHI Water Oasis, featuring a vitality hydro pool, a herbal steam room, tundra and tropical showers, an ice fountain and a relaxation area. The Sifawy Boutique Hotel (4 start) offers a warm and friendly atmosphere, reflecting the hospitable nature of the Omani people and is only 45 minutes’ drive from Muscat. Sifawy, meaning “those from Sifah” offers a contemporary blend of European design with a strong essence of traditional Omani influence; both in the concept and service. Designed by renowned Italian designer Alfredo Freda, the hotel is ideally located on the picturesque marina. With only 55 guest rooms, including 30 suites, each room has a private balcony, and is equipped with all the essential amenities and services, catering for the most discerning traveller. Guests looking for authentic regional and international dining experiences will enjoy the all-day dining restaurant, Al Sabla, or the beach restaurant, As Sammak, offering fresh, locally-sourced seafood. The hotel also features a large swimming pool, outdoor Jacuzzi, fitness centre, treatment room, in addition to a wide range of activities and excursions which take advantage of its location on one of the most beautiful beaches in Oman. These include boat trips along the coast with dolphin watching and snorkelling. 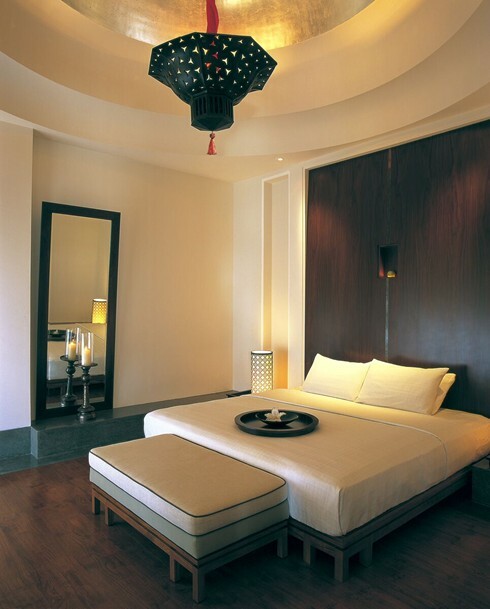 Elegant and understated, this 4-star hotel was designed in a classic oriental theme by Egyptian architect, Adel Mokhtar. The décor and furnishings of this Orient inspired hotel exude a refreshing blend of contemporary European and traditionally Oriental flavours. The hotel offers a variety of recreational facilities and services, including 2 large swimming pools, a state-of-the-art wellness centre and intimate guestrooms. Nestled on the picturesque marina promenade of Salalah Beach and facing the Indian Ocean, the hotel offers 65 guestrooms, including 21 wonderfully designed and spacious Marina Suites and 44 Juweira Rooms. Each room has access to a private terrace overlooking the Ocean surrounding Oman. 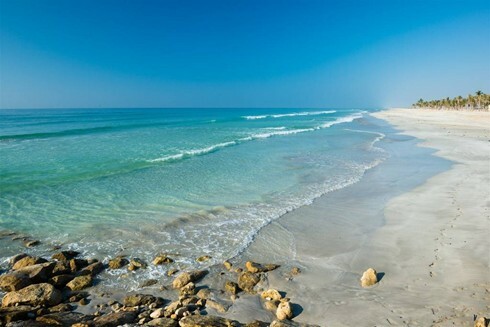 Salalah Beach offers an real taste of Oman and Arabia. The traditional lifestyle and values are expressed in the glowing architecture and aromatic food along with the scents of frankincense and sandalwood. Dining and entertainment options vary from the traditional, whilst embracing the philosophy of fresh, locally-sourced food. All-day dining is offered at Al Fanar or the speciality seafood restaurant As Sammak where the freshest produce cooked to order can be enjoyed in the evening. Sahab is a unique and tranquil luxury boutique hotel situated on the Saiq Plateau which is located 2,004 metres above sea level on Jebel Akhdar in the western Hajar Mountains, overlooking a canyon that contains ancient villages and famous terraced farms/gardens. The hotel is designed and built in tribute to the charm of the mountain, linked with modern life styles. Over 5,000 square metres of native plants and 270 million years old marine fossils are located in the garden surrounding the 27 luxurious hotel rooms and suites. The service at the Sahab is very warm and welcoming, as becomes a smaller more personal hotel. 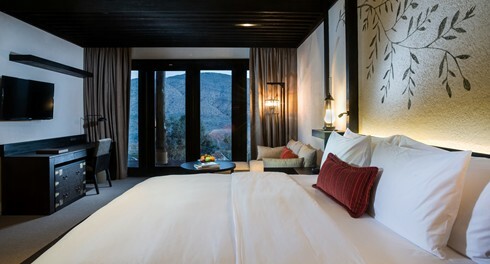 Perched 2,000 metres above sea level, the 5 star Alila Jabal Akhdar overlooks a dramatic gorge, surrounded by awe-inspiring views of the Al Hajar Mountains. This resort is the perfect base for exploring the region’s magnificent landscape of rugged, untouched beauty while experiencing the height of sumptuous comfort. Favoured amongst hotels in Nizwa, the Alila is a haven for adventure travellers, nature lovers and those seeking a retreat from the desert heat. Named after the juniper trees that grow in the highlands of Oman, the Juniper Restaurant satisfies all your culinary cravings, from breakfast through to dinner. As you feast your eyes on the mountain horizon, savour an international menu inspired by the golden age of Arabic cuisine, in a wonderfully relaxed and romantic atmosphere. Featuring seven treatment and changing rooms, including a Vichy shower room, Jacuzzis, Spa Alila is a peaceful sanctuary dedicated to pampering you from head to toe to restore a sense of total well-being. Besides a wide array of Asian-inspired treatments, the spa experience is infused with the essence of the destination. Step back in time in the steam room, the air filled with a mist of heady, earthy and cleansing oils, grounded in frankincense and juniper berry, reminiscent of ancient Oman. Enjoy the pure, gentle and 100% natural Juniper Berry and Rose Handmade Soap, a signature feature throughout the resort and guest rooms.